This book identifies five basic musical features that jointly contribute to the sense of tonality, showing how they recur throughout the history of Western music. The goal is to create a new framework for thinking about music, one that emphasizes the commonalities among styles from Medieval polyphony to contemporary jazz. 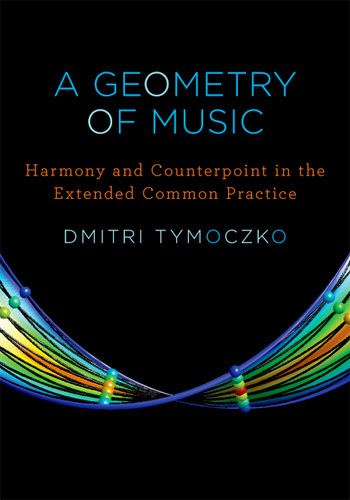 A Geometry of Music provides an accessible introduction to a new, geometrical approach to music theory. The book shows how to construct simple diagrams representing voice-leading relationships among familiar chords and scales. This gives readers the tools to translate between the musical and visual realms, revealing surprising structure in otherwise hard-to-understand pieces. I then use these theoretical ideas to retell the history of Western music from the eleventh century to the present day. Arguing that traditional histories focus too narrowly on the "common practice" period from 1680-1850, I propose instead that Western music comprises an extended common practice stretching from the late middle ages to the present. To support this, I analyze host of familiar pieces by Bach, Mozart, Chopin, Debussy, Stravinsky, Shostakovich, Miles Davis, Bill Evans, and others. A Geometry of Music is accessible to a range of readers, from undergraduate music majors to scientists and mathematicians with an interest in music. Defining its terms along the way, it presupposes no special mathematical background and only a basic familiarity with Western music theory. The book also contains exercises designed to reinforce and extend readers' understanding, along with a series of appendices that explore technical details.